The INSPEX system will adapt obstacle-detection capabilities common in autonomous cars for portable and wearable applications, including guidance for the visually impaired and blind, robotics, drones and smart manufacturing. It will be used for real-time, 3D detection, location and warning of obstacles under all environmental conditions. These include smoke, dust, fog, heavy rain/snow, and darkness, and in indoor and outdoor environments with unknown stationary and mobile obstacles. Applying expertise and technologies of the nine partners in the three-year project, the system will be based on state-of-the-art range sensors such as LiDAR, UWB radar and MEMS ultrasound. Coordinated by Leti, INSPEX will miniaturize and reduce the power consumption of these sensors to ease their integration in the new system. They will then be co-integrated with an inertial measurement unit (IMU), environmental sensing, wireless communications, signal-and-data processing, power-efficient data fusion and user interface, all in a miniature, low-power system designed to operate within wider smart and Internet of Things environments. 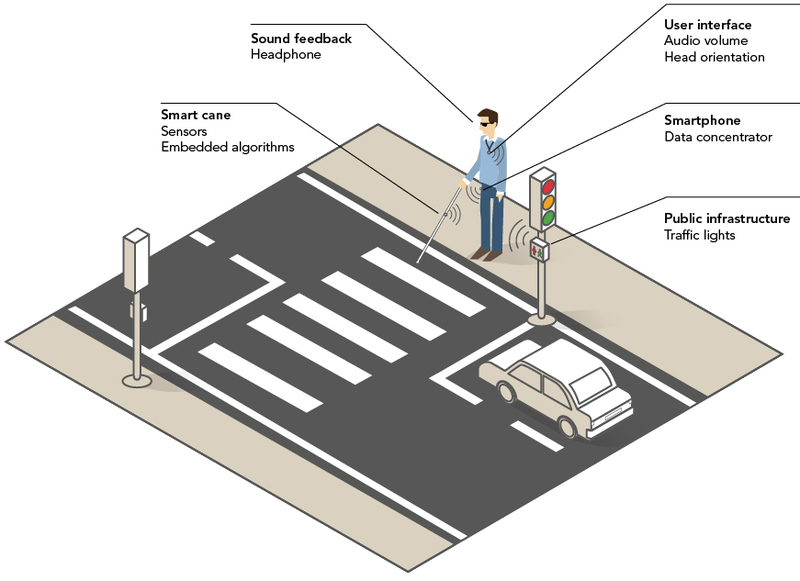 The main project demonstrator will embed the INSPEX system in a white cane for the visually impaired and provide 3D spatial audio feedback on obstacle location. The INSPEX demonstrator will integrate the INSPEX mobile detection device into a white cane for the visually impaired. For this application, an Augmented Reality Audio Interface will be integrated to provide spatial 3D sound feedback using extra-auricular earphones. This feedback will take into account head attitude, tracked by an AHRS in the headset, to provide 3D spatial sound feedback of an obstacle’s real direction and range. The context-aware communications will integrate the user with wider smart environments such as smart traffic lights, navigation beacons and ID tags associated with IoT objects. The user’s mobile device will allow integration with, for example, mapping apps. Leti, a technology research institute at CEA Tech, is a global leader in miniaturization technologies enabling smart, energy-efficient and secure solutions for industry. Founded in 1967, Leti pioneers micro-& nanotechnologies, tailoring differentiating applicative solutions for global companies, SMEs and startups. Leti tackles critical challenges in healthcare, energy and digital migration. From sensors to data processing and computing solutions, Leti’s multidisciplinary teams deliver solid expertise, leveraging world-class pre-industrialization facilities. With a staff of more than 1,900, a portfolio of 2,700 patents, 91,500 sq. ft. of cleanroom space and a clear IP policy, the institute is based in Grenoble, France, and has offices in Silicon Valley and Tokyo. Leti has launched 60 startups and is a member of the Carnot Institutes network. This year, the institute celebrates its 50th anniversary. Follow us on www.leti.fr/en and @CEA_Leti.